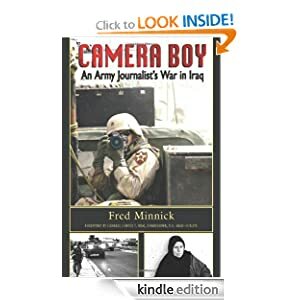 Fred Minnick spent more than a year in Iraq as a U.S. Army public affairs photojournalist, covering the good, bad and ugly sides of the conflict. With a Nikon in one hand and an M-16 in the other, he accompanied combat troops on missions ranging from raids on suspected terrorist strongholds to public relations events including the opening of a school for girls. Some of the stories made it back home, most did not. Camera Boy offers an eye-witness account of the Iraq War from a soldier with a different POV–from behind a camera and typewriter. Unfortunately, being assigned to public affairs did not shield Staff Sergeant Minnick from the horrors of war–including the deaths of two close friends–or from the devastating effects of PTSD upon his return home.It is a story of courage, frustration (with both the military and the mainstream media), dedication and redemption. Includes more than 40 black and white photos taken by the author. Fred Minnick is an international writer and photographer, and a contributor to Simon & Schuster’s The Blog of War: Front-Line Dispatches from Soldiers in Iraq and Afghanistan. He covers a wide range of subjects for various media outlets. He lives in Louisville, Kentucky, with his wife, two cats and dog. Also you can download Word Run Pro for free. It is a game for your Kindle Fire or any other Android devices. Do the Alphabet ShuffleHow far can you run in Word Run Pro? That depends on how many words you can find from seven random letters. Form words of three letters or more. Don’t repeat yourself–the more unique words you find, the more points you get. The longer the word you find, the more added time you get to find new ones. Once you run out of words, advance to the next level and get new letters. Try Practice mode–a timerless version–before you start running, just to get a feel for the game. When you’re ready to run, find as many words as possible from a pile of seven random letters as you work against the clock. Get a “run” of words from the same set of letters to increase your word score. Select letters from the Rack in the middle of the screen to form a word of three or more letters. If the word you create is listed in the dictionary, and it hasn’t already been used on the level, then the word is accepted. The word will be added to an area at the bottom of the screen for your reference. If you can’t find any more words from the rack, then advance to the next level and receive new letters. The score for the level’s seven letters is reset when you advance to the next level, so it pays to find as many words as possible on any given level. There are a number of achievements to complete outside the normal rules of the game. These include having a particularly good run of words within a level, having consistently good runs over a number of levels, and finding a set number of words in each word length group. Also, there is a small bonus added to your time when you start a new game based on the number of achievements you have completed. 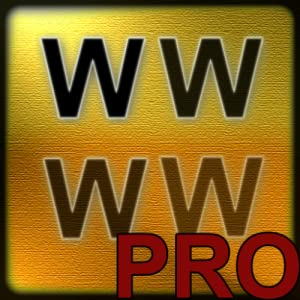 The dictionary uses professional word game tournament word lists (like SOWPODS and TWL06) and both U.S. and U.K. spellings.